A sixty-two-year-old man went to the ER. Doctors found a large mass pushing his stomach down between his hips. They removed the twelve-pound mass. It was not a tumor. The man had swallowed $650 worth of coins. He had a psychiatric condition called pica in which a person eats inanimate objects. Are you a glutton for possessions? "When Solomon finished praying, fire came down from heaven and consumed the burnt offering and the sacrifices, and the glory of the Lord filled the Temple…When all the Israelites saw the fire coming down and the glory of the Lord above the Temple, they knelt on the pavement with their faces to the ground, and worshiped and gave thanks to the Lord (2 Chronicles 7:1-3)." God's presence came to dwell in this earthly Temple—declaring it to be His own. Very visible. Very memorable. I've always loved this passage as well as the similar event in Exodus when God comes to dwell in the Tabernacle (Exodus 40:34-38). The Ark of God was present both times—representing the holiness and power of God plus His covenant with Israel. In 2 Chronicles 5:4, the Ark was visible to everyone in Jerusalem that day—a huge crowd including the elders of Israel, all the heads of the tribes and the chiefs of the Israelite families, all the men of Israel, the Levites and the inhabitants of Jerusalem, including the king (verses 2-4). During the Exodus from Egypt, the Ark had been visible to everyone present in the desert (men, women, children, foreigners and Jews alike) whenever the camp moved. The Levites carried the Ark in procession to the next location. When the cloud of God lifted up, the Tabernacle was packed up, and the camp moved following the cloud to the next location. Everyone saw that. 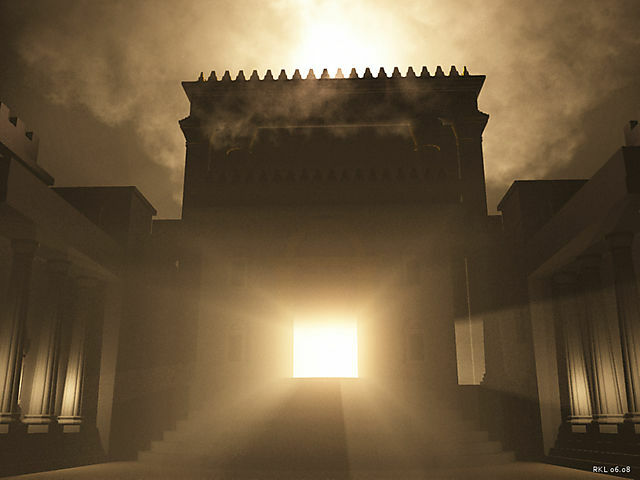 Here, only those present in Jerusalem saw the procession moving the Ark of God to its resting place in the Temple, the fire from heaven to the altar, the glory of the Lord above the Temple, and the cloud filling the Temple. Those who remained at home could only hear about it. I felt sad for them. There was no YouTube video they could watch of this event. I wish I was there! Don't you? communication and influence as to talk well." Leaders who don’t listen talk their way right out of leadership. That’s exactly what happened to Rehoboam, Solomon’s son, who disqualified himself as king over most of Israel because he refused to listen to his followers. What a leader loves determines how a leader leads. Consider Solomon, for example. Solomon loved the Lord and walked according to the statutes of his father, David . . . As long as Solomon loved the Lord and walked according to David’s ways, he was humble and trusted God for an understanding heart because he knew he was not adequate to lead God’s people. Solomon demonstrated his love for the Lord by living in radical dependence on Him. Because of this request God gave Solomon a discerning heart and with it, God gave him more than he asked for: riches and honor and the possibility of a long life (I Kings 3:3-15). It was out of his love for the Lord that Solomon built and dedicated the temple (I Kings 5-6) that had been the passion of his father’s devoted heart (I Kings 11:4).